Pump covers come in many different shapes and sizes. They also protect a variety of pumps with different capabilities. You may need an enclosure for a booster pump in a fire fighting system, hydraulic pumps that push fluids, and even water booster pumps. Despite their differences, one thing they all have in common is the need for a pump cover with these six must-have features. Your pump cover should not only provide easy access to your booster pump, but it should also protect it, and hopefully extend the pump’s life. Leaving a pump and their control panels in the open creates an opportunity for thieves, and exposing it to the elements allows Mother Nature to cause all sorts of problems. So, let’s take a look at six critical features your pump cover needs to keep it safe and working properly. Pump covers make climate control easy. Let’s first discuss how they keep things cool. Most booster pumps produce heat that needs to be removed. This keeps your pump from overheating. If your pump overheats, it can also damage your control panel. But if it has a pump cover with an exhaust fan on one end, and a louver on the other, air will be pulled through the enclosure. This keeps temperatures down and protects your equipment. Even though pressure boosting pumps produce heat on their own, not all pumps continuously run. They need to be heated during winter months. Take fire booster pumps, for example. They're often located outside, near large box stores and warehouses. Fire booster pumps may contain small amounts of water when not in use and usually only run for a few minutes each week when they’re being tested. This allows for the potential for freezing in colder climates. It’s important to keep these types of pumps warm and in good working condition so they perform when needed in emergencies. When working with a pump skid, it most likely won’t have a floor or a concrete slab. In this case, you will want to use a wall-mounted heater. It can be affixed to the inside of the pump cover wall. Putting the heater here will keep it away from other equipment, potential leaks and spills. If you’re working with a pump enclosure that has a floor or concrete slab, a slab-mounted heater tends to work well. 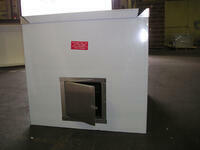 This type of heater is mounted to the slab and provides radiant heat that warms the air of the enclosure and the slab. Insulation is also an important factor when considering temperature regulation. We recommend a minimum R-value of 9.0 for our enclosure walls and 18.0 for our roofs. Many pumps have control panels and equipment that needs to be accessible for maintenance and repairs. It is very important that your pump cover has lockable access panels that make it easy to maintain and test your equipment. It is also a good idea to make the roof of the enclosure removable or hinged to allow equipment to be easily removed and added. You can also add lighting for better visibility. Booster pumps have inlet and outlet pipes that will run in and out of your enclosure, hence the need for creating piping penetrations. Although we are able to produce penetrations at our manufacturing facility, we recommend that the penetrations be made at the location of the project. This is because the placement of pipes may not end up where originally planned. Making the penetrations on-site provides more flexibility for those situations where things are a little off. Pump equipment can be susceptible to theft and vandalism. Providing a lockable enclosure or cover can help in deterring thieves and keeps equipment safe from vandals. We utilize lockable handles in our access panels that, when used in combination with your favorite padlock, keep your pump secure. Certain equipment like HVAC pumps, compressors and generators can produce quite a bit of noise. This can create a safety and health issue if workers are working nearby. Insulation is key in this situation. In order to reduce the amount of noise generated by the equipment, you want to keep the noise reduction coefficient rating in mind. This grades the amount of noise the panels and insulation of the enclosures will absorb. We use materials that will absorb about 85 percent of the noise generated by the equipment or a .85 NRC rating. Protecting pump equipment from weather and the elements is a critical feature of a pump cover. Pump covers contain sensitive equipment such as control panels and electronics that don’t like to get wet or covered in snow. You’ll want one capable of standing up to wind and rain and able to handle heavy snow, too. If you’re in the market for a pump cover, here’s a quick and easy way to find out what you need. Our guide: “How to Design and Buy a Pump Enclosure”will show you how. This checklist will walk you through all of the necessary steps.